Family History Library, microfilm 1,698,034, item 17; it can be ordered by any Family History Center. Sharon Carmack kindly gave permission to PPGS to include the index to Ramah Public Cemetery in this resource. Page numbers refer to the 1993 edition. 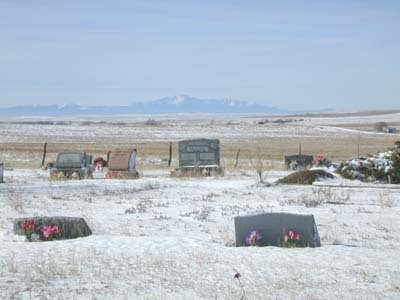 The cemetery is visible from U.S. Highway 24. To access it, turn south onto Ramah Road just past the Ramah water tower. 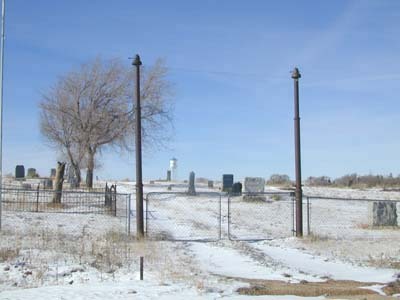 According to GPS-derived geolocation (accurate to within 10 meters), the cemetery's coordinates are latitude 39°07'04.1"N and longitude 104°09'47.8"W. The Colorado Cemetery Directory notes that the town of Ramah was established in 1888. The first marked burial in this cemetery is dated 1867, but it was perhaps moved from another cemetery. The next earliest burial is dated 1887.